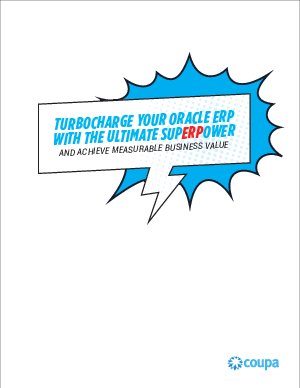 Supercharge your Oracle ERP and unleash a burst of business value. Your ERP is the financial backbone of your organization, bringing together departments, divisions, locations—ERPs struggle to keep up with the pace of change, and this is especially true when it comes to managing spend. Download this whitepaper, to learn how Coupa can add real, measurable value to your Oracle ERP investment.